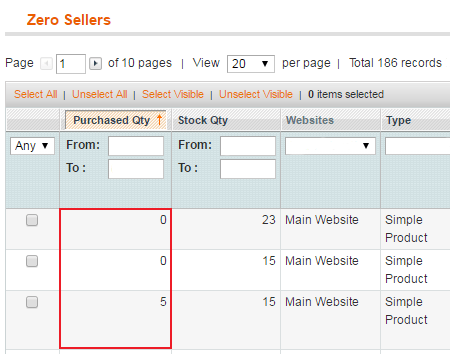 Add a special 'Zero Sales' report to find out which of your store items are not selling. Sort products by type, status, price and other parameters to keep track of all zero sellers. Modify special price right on the grid to improve your marketing strategy and boost profits. Do you know how much money you lose on zero sellers every day? Why keep offering items which don't bring any profit? With the Zero Product Sales extension you will easily convert lost opportunities into sales. Due to automatically generated reports you'll be able to keep track of all store items which are not selling. Easily change product special prices right on the 'Zero sellers' grid to draw customers' attention to necessary items and increase sales. Get additional reports on your store performance with the Magento reports extension. The module automatically generates an informative report which includes the list of all store items with low and zero sales. Due to the report an admin user will quickly find out which products don't enjoy popularity and eventually don't bring any profit. Specify any time period you need for accurate report generating to get precise information. 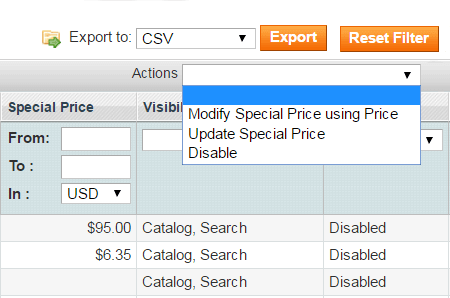 This handy option will help you create up-to-date reports and immediately modify special prices if necessary. The module allows you to generate reports basing not only on zero sales, but on low sales as well. Therefore, you can specify the number of product sales that should be also included in the report. Due to flexible settings it's possible to edit and assign special prices in bulk. Simply select necessary items, choose the price change mode, specify the price change amount (e.g. -20, +10) and click the 'Submit' button. Export report data to CSV and Excel XML files for further consideration. Look though zero sale items to find out the reasons for their low popularity and change your marketing strategy accordingly. In case you want to stop selling particular products from the zero sellers list you can easily disable them right from the grid. Use the 'mass actions' option to switch off multiple items in one go. The module lets you easily sort grid items by product type, name, status, price, stock quantity and other criteria to quickly find necessary products and modify their data the way you need. Great extension, even better support. Amasty fixed an issue in the first version which made the extension slow to load. Now it works just fine. I was pleasantly surprised to come against this free plugin. It really adds some points to our store functionality and generates pretty good zero sales reports. The app installation was easy and everything runs as described. I've been using it for two days and hope it'll work the same way as it does now.